Any experienced livestock farmer will tell you that you can never succeed in this business endeavour unless you preserve enough livestock feeds. Just like you need enough stock for your supply business, you need enough fodders for your livestock to make a good profit from livestock farming. Therefore, before you venture into this business, you need to consider the availability of feeds and also learn the various ways of preserving it. Corn is one of the stable feeds for livestock after glass and pasture in general. Therefore, if you are considering preserving forages, then corn should be a good starting point. When it comes to preserving corn, there is no better way than making silage. Unlike glass and other fodder crops where you can either make hay or silage, the only option when preserving corn is to make silage. There are many benefits of corn silage one of which is that it is very nutritious when you harvest at the right time and preserve properly. If you are new to the silage making process, then this article is for you. Although this article will not explain the whole process from growing corn etc., it will touch on harvesting and making the silage. When your corn starts flowering, it is the perfect time to harvest. At this stage, you are sure to get highly nutritious feeds which is what your livestock needs for better production. When harvesting, you can do it manually or mechanically depending on the size of your farm and the availability of machinery. If you are a large-scale farmer, then you are better with a mechanised process. The mechanised process involves hiring a combined corn harvester that will harvest the corn, chop into pieces and then load the chopped corn into lorries or trailers for transport. After chopping the corn, the next thing is preservation. 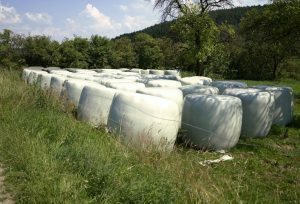 With preservation, you can either use silage pits or the modern way which is using heavy duty silage covers. The contemporary approach is the easiest, most economical and less complicated. All you need is identify a location in your farm, lay the silage cover and then pour the silage. As you put in more silage, you can use a tractor to compress the silage, or you can use drums. Once you are done placing the chopped corn, you then use another silage cover to cover the silage. When it comes to wrapping, make sure that the cover is well tacked in on the sides to avoid water damages. Once you are done covering, use used tires to place weight on the silage cover. This way, you will minimise the chances of wind damage, and your silage will remain safe for up to 12 months.